***UPDATE*** Congrats to our winners: Andie Shaw (blog post winner) and Melyum (Twitter winner). Want to win a free ticket to the largest online social media marketing event of the year? 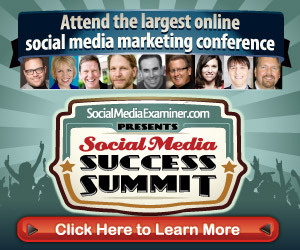 Social Media Examiner has worked hard to bring you our fifth-annual Social Media Success Summit. This is our biggest event ever! And we’ve come up with a fun way to get you involved. First, what is this event? Social Media Success Summit 2013 is a large online conference dedicated to helping marketers and business owners master social media marketing. More than 1900 businesses have already signed up! Hundreds of small businesses and well-known brands such as Wells Fargo, Motorola, AT&T, 3M, World Vision, United Way, US Chamber of Commerce, Dell, Dow Jones, Penn State, US Air Force and PBS will be attending this year’s summit. Forty-five of the world’s most respected social media experts will share their strategies with you. Hear from Jay Baer (author,Youtility), Chris Brogan (co-author, Impact Equation), Mari Smith (co-author, Facebook Marketing), Michael Stelzner (founder, Social Media Examiner), Mark Schaefer (author, Return on Influence), Jesse Stay (author, Google+ for Dummies), Amy Porterfield (co-author, Facebook Marketing All-in-One for Dummies), Michael Hyatt (author, Platform) and experts from Walmart, Salesforce, General Electric, Target, Sony, E! 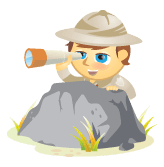 Online, Kelly Services and Discovery Channel–just to mention a few. Presentation topics include Facebook marketing, LinkedIn marketing, Twitter marketing, Google+ marketing, Pinterest marketing, video marketing, blogging, podcasting and more! Check out all the sessions. At last summer’s summit, 98% of attendees said they’d recommend the event to a friend and attend again. How can you win tickets? We have three free tickets to the summit valued at $597 each, plus the opportunity to be promoted to more than 220,000 of your peers! And remember, this is an online conference—so no travel is required to participate. You can tweet up to two times per day. Each tweet is an entry to win. We’ll randomly draw the winner of a free ticket. All tweets must have the #winSMSS13 hashtag included. The winner gets two tickets PLUS a mention in the Social Media Examiner Newsletter (220,000+ subscribers)! Simply write about your biggest social media marketing challenge in the comments box below (scroll down). The judges (Michael Stelzner, founder of Social Media Examiner and Jay Baer, founder of Convince and Convert) will select the winning entry. Their decisions are subjective and final. You can enter to win either or both prizes. The deadline is Friday, September 6, and the winners will be announced shortly thereafter. If you’ve already purchased a ticket, no worries. If you win, we’ll either give you a full refund or you can give your spare ticket to someone you really like. We look forward to seeing your comments and tweets. Good luck! Phil Mershon is the director of events for Social Media Examiner. He has worked nearly 25 years in corporate training and management. Phil is also a professional jazz and church musician.